A designated marksman rifle (DMR) is the scoped high-precision weapon system used by modern infantries in the designated marksman (DM) role. Although the "sniper" and the "designated marksman" are distinguished by mission and deployment role, rather than by operational range, the DM's role generally fills the engagement range gap (300–600 m or 1,000–2,000 ft) between a regular infantryman and a dedicated sniper. DMRs are developed with the mindset to fulfil this middle ground in tactical role. DMRs, unlike the often bolt-action sniper rifles, are almost always semi-automatic rifles as these have higher rates of fire than bolt-action rifles, and typically have larger magazine capacities (10, 20, or 30 rounds depending on the firearm and operational requirements) to allow rapid engagement of multiple targets. These rifles have to be effective, in terms of hit rates and terminal ballistics, at ranges exceeding those of ordinary assault rifles and battle rifles, but do not require the extended-range performance of a dedicated sniper rifle. DMRs often share some basic characteristics with sniper rifles when compared to the weapons carried by others in the DM's platoon. DMRs may have an attached telescopic sight, quickly deployed stabilizing bipod to allow optimized accuracy and low-recoil in temporarily fixed situations or an adjustable stock. The designated marksman's rifle needs to function as part of squad (and possibly at close quarters). Most designated marksman rifles are based on an assault rifle that is currently issued by a nation's military, or on a battle rifle that was formerly issued. A battle rifle is a semi-automatic or full-automatic rifle that fires 7.62 mm NATO or similar full-power rounds. Classic examples include the M14, FN FAL, AR-10 and Heckler & Koch G3. These rifles were largely replaced by assault rifles firing the 5.56 mm NATO cartridge during the 1980s and 1990s, but many were accurized and retained as DMRs. Conversely, some nations have also built rifles that were designed for the designated marksman from the ground up. Examples include the Soviet SVD and Chinese QBU-88. Some designated marksman rifles will have some type of optical sight with a higher magnification level than the standard issue rifle. For example, the SDM-R issued to the United States Army is fitted with a Trijicon 4× ACOG, while the standard-issue M4 carbine is equipped with an unmagnified Aimpoint CompM2 or CompM4. Commonly, the sighting system will be the only difference between the standard rifle and the designated marksman rifle, as is the case with the F88S DMR issued to the Australian Army. Sniper rifles often have even greater magnification than designated marksman rifles outfitted with magnification, for example, the M110 SASS used by the United States Army, is equipped with a Leupold 3.5-10× variable-power scope. However, some designated marksman rifles, such as the Mk 12 Special Purpose Rifle or the USMC Squad Advanced Marksman Rifle are fitted with scopes with similar magnification. In some cases, the designated marksman rifle will have a longer barrel than the standard issued rifle, however, this is not universally true. For example, until October 2015, when the M4 carbine was approved as the new standard issue rifle, the M16A4 rifle was still standard issue throughout the United States Marine Corps. The barrel on the Mk 12 Special Purpose Rifle, the current rifle used by the squad designated marksman in the USMC, is only 500 mm (18 in) long - 50 mm (2 in) shorter than the barrel on the standard rifle. This no longer the case, however, as the M4 carbine has a barrel length of only 370 mm (14.5 in). Also, some rifles, such as the F88S Austeyr, have a barrel that is the same length as the standard service rifle. The FD-200 has an accurized barrel, also found on designated marksman rifles. Most sniper rifles, such as the Accuracy International Arctic Warfare have a barrel with a length of 610 mm (24 in) or greater. Only the SVD and similar designated marksman rifles have a barrel of this length. The designated marksman rifles based on the M14 have barrels 460 - 560 mm (18 - 22 in) long. In most cases, a designated marksman rifle will share the caliber and possibly even the ammunition type used by standard issue rifles. DM rifles may be issued with standard ball ammunition, or special match-grade loads, such as 7.62 mm NATO 'M118LR' sniper round. Sniper rifles are (almost exclusively) deployed with match grade ammunition in order to take advantage of their full effective range and accuracy potential. In the U.S. military, designated marksman rifles chambered for 5.56 mm NATO have available the 5 g (77 grain) match-grade Mk 262 Mod 0/1 [note 1] cartridge that enhances the effective range to roughly 600–800 m (2,000–2,600 ft). All designated marksman rifles in use today are semi-automatic, some are select fire. Sniper rifles are generally bolt action rifles, but can also be semi-automatic. Argentina: FAMTD is a variant of the FN FAL with an accurised barrel, sniper stock and bipod. F88S Austeyr 5.56 NATO standard issue rifle, fitted with an enhanced optic is issued to one rifleman in each fireteam in the Australian Army. SR-25; 7.62mm NATO sniper rifle is often used to provide fire support. HK417; 7.62mm NATO battle rifle, interim F88S replacement for Afghanistan deployments. Mk 14 Enhanced Battle Rifle; 7.62mm NATO rifle is in limited service. Austria: The Steyr AUG HBAR-T, is a longer heavier-barreled version of the Steyr AUG designed for use as a designated marksman rifle that can be fitted with a variety of optical sights. Canada: The Canadian Forces issue the C7CT and C8CT designated marksman rifles, which are based on the C7 and C8 rifle. They also use the AR-10T. Chile: The FD-200 is a variant of the SIG 542 with an accurised barrel, sniper stock and bipod. The QBU-88 is a designated marksman rifle deployed by the People's Liberation Army and People's Armed Police, intended for aimed semi-automatic fire at ranges beyond the capabilities of standard infantry assault rifles. The SVD is the designated marksman rifle in Cold War era and still remain usage in reserve forces. France: The FAMAS G2 Sniper is a designated marksman rifle fielded by the French Army. It is based on the FAMAS G2. The German Army uses the G3A3ZF-DMR, a modified version of the Heckler & Koch G3 battle rifle, as a designated marksman rifle and recently introduced the G28. The Heckler & Koch HK417 is chambered for 7.62mm NATO and has been adopted by several nations for use as a designated marksman rifle. Galatz is standard issue marksman rifle of Georgian Armed Forces, thought some reserve and second line units still use SVD. The SVD is the main designated marksman rifle for the Hungarian Armed Forces. Hungary manufactures the bull-pup designed Szép sniper rifle chambered for 7.62×51mm NATO. Hungarian Special Forces uses also the M24 Sniper Weapon System. Hungarian Armed Forces designed the anti-material sniper weapons family called Gepárd. The SVD is the designated DMR for the Indian Army. Different variants of the INSAS family of weapons modified with scopes and other tactical upgrades are used as DMR's as well. The IMI Tavor TAR-21 and the IMI Galil chambered for the 7.62 NATO round are issued to units of the Special Forces of India as a Designated Marksman Rifle. Indonesia: The Pindad SS2-V4 is a designated marksman rifle said to be used by the Indonesian special forces. It is based on the Pindad SS2, with a lengthened barrel and a telescopic scope mounted on a Picatinny rail. Iran: The locally produced G3A6 fitted with Hadaf 3 telescopic sight is used as a designated marksman rifle by Iran Army special forces and Iranian Police Special Unit. The Israel Defense Forces formerly used the Galatz as a designated marksman rifle. The Galatz is a variant of the Galil assault rifle chambered for 7.62mm NATO. The M4A1 is used as a marksman rifle, equipped with Harris bipod and Trijicon ACOG telescopic sights. The M4A1 replaced the M16A2, which is still used by some infantry reserve units. The STAR-21 Tavor is a variant of the Tavor assault rifle used as a designated marksman rifle by the Israeli Defense Forces. It is fitted with a picatinny rail that allows for the attachment of various optical sights (typically an ACOG scope) and a bipod. Japan: The Howa Type 64 as a marksman rifle. Norway: HK417; 7.62mm NATO gas-piston battle rifle. Philippines: The Philippine Marine Scout Snipers developed and use the Marine Scout Sniper Rifle, a derivative of the M16 rifle. The Philippine Army uses the M14 as a marksman's rifle, while some units also use the SR-25 in limited numbers. Newer M16-derived marksman rifles such the Squad Designated Marksman Rifle (SDMR) and the Special Purpose Rifle (SPR) are being introduced to replace the M14 and are currently in service with the Army's Scout Ranger Regiment. Portugal: The Portuguese Army uses the Heckler & Koch G3 as a marksman rifle. Romania: The PSL (rifle) is a purpose-built designated marksman rifle chambered for 7.62×54mmR based on a modified Kalashnikov action. It is similar in appearance to the SVD, though the two rifles share little in common. The SVD was the first rifle designed from the outset as what is now known as a designated marksman rifle. Accurised former standard service South African Defence Force R1 rifles are used by the South African Army as designated marksman rifles. Being phased out in favour of the new R4 DMR modified rifle being introduced at section level. Scoped and accurised Vektor R4 rifles are used as designated marksman rifles by soldiers of the South African Army. The Swiss Armed Forces use the standard issue SIG SG 550 with a Kern 4×24 telescopic sight as a marksman rifle. SIG716 DMR Gen2 replacing SG 550. L129A1 ; a 7.62 NATO, 16 in (410 mm) barrel variant of the SR-25 developed by Lewis Machine and Tool Company has been procured for use in Afghanistan. A 6× power ACOG is the standard issue sight. The L86A2 LSW is chambered for 5.56mm NATO was originally fielded as a section LMG, but was later re-purposed as a designated marksman rifle. M14SE Crazy Horse: Used by the 101st Airborne Division and the 2nd Infantry Division of the US Army. Colt Model 655 and 656: Never standardized. Predecessor to other M16-based designated marksman rifles. Mk 12 Special Purpose Rifle: Used by the United States Navy SEALs, Rangers. Replacing the SAM-R in United States Marine Corps service. SR-25 Mk 11: Used by the United States Marine Corps, United States Navy SEALs, and the United States Army. Replaced by the SSR Mk 20. M110 Semi-Automatic Sniper System used by the United States Army and United States Marine Corps replacing some M39 and all SR-25 Mk 11. The Heckler & Koch HK417 in variant Sniper has been adopted by Delta Force of the United States Army and SEAL Team Six of the United States Navy for use as a designated marksman rifle. The FN SCAR in variant Sniper Support Rifle (SSR) Mk 20 Mod 0 has been adopted by all branches of USSOCOM (e.g. 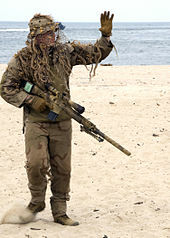 SEALs, Rangers, Army Special Forces, MARSOC, AFSOC) replacing the SR-25 Mk 11. Yugoslavia: The Zastava M76 is a designated marksman rifle based on a modified Kalashnikov action. It is chambered for 7.92×57mm Mauser. It has also been chambered in 7.62×51mm NATO and 7.62×54mmR. Federal Republic of Yugoslavia: The Zastava M91 is a purpose-built designated marksman rifle based on a modified Kalashnikov action and chambered for 7.62×54mmR. PSL (left) and SVD (right) rifles in Iraqi service. US Marine manning a Mk 12 Mod 1 Special Purpose Rifle whilst others pinpoint targets. ^ In the U.S. military, 7.62×51 mm (.308 rounds) are most commonly used for marksmen, as they are cheaper. ^ Muir, Tom (1 February 2010). "Land Force: Army's broad fire capabilities key to mission success | ADM Feb 2010". Australian Defence Magazine. Archived from the original on 6 July 2011. Retrieved 9 June 2011. ^ Wellfare, John (14 April 2011). "Shooting for modern combat". Army News (Australia). Retrieved 9 June 2011. ^ Pratt, Anthony. "COMBAT SHOOTING, A NEW PERSPECTIVE". Australian Army Journal. ^ "Contract Notice View - CN352591". AusTender. Australian Government. 14 December 2010. Retrieved 30 January 2011. ^ Hetherington, Andrew (3 February 2011). "Extreme Peril". Army News (Australia). Retrieved 9 June 2011. ^ "H&K 417 CALIBRE 7,62x51mm NATO - Operacional". ^ Pellumb Nili (26 December 2007). "hk in albania" – via YouTube. ^ "DIMOC - Home Page". ^ "34. Bercsény László Különleges Műveleti Zászlóalj". ^ Engelbrecht, Leon. "Fact file: R1 battle rifle". defenceweb.co.za. defenceweb. Retrieved 24 August 2014. ^ Engelbrecht, Leon. "R6.2 million for R4". defenceweb.co.za. DefenceWeb. Retrieved 24 August 2014. ^ Kokalis, Peter (2005). "M14 reborn: Crazy Horse and the Romanian Option". Shotgun News. 50 (12): 20–22, 24, 26. ^ "M39 Enhanced Marksmanship Rifle - US Special Operations - Weapons". ^ "SRCSGT - 10 - The Marine Corps Systems Command desires to collect information regarding potential rifle scopes to be utilized on Sniper Rifles (M40A3, M107, Mk11, Mk 12, M14 DMR and M39 EMR). - 03-Aug-08 - FBO#2442". ^ Bryant and Bryant, Weapons of the US Army Rangers. Copyright 2005, Zenith Press.